Sorry to be cliche, but I am going to have to go the bridal portrait route. (Hey, I spent a lot of money that day so I should have looked decent, no matter what!) Hopefully my reasons for choosing this are a little less cliche, though. 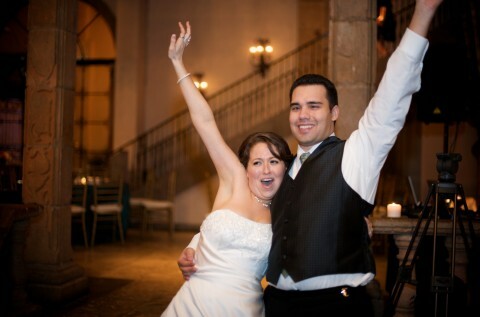 "Sweet Caroline" had to be played at my wedding; it's just a fun song. I requested for it to be played near the end. By this time, the casual guests had left, the traditional stuff was out of the way, and I had had plenty of wine. The way I remember it, all of the guests got on the dancefloor, if nothing else, just to fist pump their "so goods" right along with us. Andrew and I ended up in the "front" area, facing all of our guests and leading them in the chant.My mouth is teal from my cake, my new husband is no longer in his tux jacket, and we are just happy, surrounded by guests and love and jamming to Neil Diamond. For so many reasons, it's a photo I love. If you follow me on twitter, you know I am going out of town again this weekend. To Dallas by way of Austin. I will be seeing Dave Matthews in concert tomorrow (yay! A favorite! ), likely going to the Sixth Floor Museum, and eating BBQ (the reason Andrew planned this in the first place - I told him I didn't want to go anywhere this weekend and he kinnnnda maybe bought concert tickets so I would have to. At least it's Dave.). 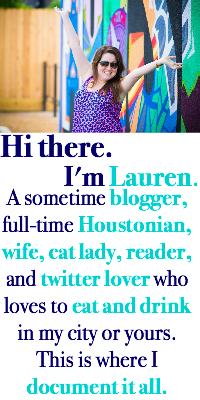 So, I won't be able to make it to the Houston blogger meet-up. Hope you guys have lots of fun and I can't wait to see the pics! This is a super cute picture! What great emotions that were captured in this picture! Looks like a wonderful day and you do look amazing! :) Have a great trip, a great concert and a great weekend! That is a great picture! You look so happy!